Ανεξάρτητη Βίλα με ιδιωτική πισίνα Κοντά σε αμμώδη παραλία και γραφικό χωριό. Αυτή η βίλα 2 υπνοδωματίων βρίσκεται σε μια ήσυχη τοποθεσία με εκπληκτική θέα. Αυτό το καλά εξοπλισμένο ανεξάρτητη βίλα διαθέτει 2 υπνοδωμάτια, 2 μπάνια και όλες τις παροχές που μια οικογένεια μπορεί να χρειαστεί, κατάλληλο για μέχρι 6 άτομα. Τα τεράστια μπαλκόνια είναι απολύτως ιδιωτικά, με θέα που κόβει την ανάσα. Για την ευεξία σας, η βίλα διαθέτει ιδιωτική πισίνα. Η βίλα βρίσκεται ανάμεσα σε ελαιώνες και πάνω από το χωριό του ψαρά Βασιλική, επίσης γνωστή για τις ιδανικές συνθήκες για ιστιοσανίδα. Η βαθιά νερά είναι επίσης ιδανικό για τα παιδιά. Αθλητισμός και δραστηριότητες περιπέτειας, όπως πεζοπορία, ιστιοπλοΐα, ποδηλασία, ψάρεμα, κολύμπι, wind-surfing, θαλάσσιο σκι, τένις, ποδήλατο βουνού, μπορείτε να απολαύσετε το αλεξίπτωτο πλαγιάς στην περιοχή. The villa is cleaned every day. The staff are gracious, kind and very attentive. The villa has everything you need for a wonderful stay. We enjoyed Lefkada , but the best part of our stay in this spectacularly beautiful island was staying in this villa . I do not usually guarantee a vacation experience.I know you will have an enjoyable memorable experience that you will remember for a lifetime. We were so fortunate to stay at this villa. It was at a perfect location. And the view was amazing no need to go anywhere else. George was always there for all our needs . Views are absolutely stunning with both the pool and the terrace itself being large enough to accommodate a large sized family/group if required. Everyone on Greece is very very friendly. We had a wonderful time. Love the daily maid service. An amazing villa even better than the photos, total luxury. The villa was lovely. It was even better than the pictures. The Villa is very well located, great views, quiet, clean, perfectly equipped and amazingly designed. We spent a wonderful and relaxing week here. The place is a dream. The island is extremely nice, with lots of things to do and very green. Even if it was high summer, you don't feel the crowds. Water sports closeby (special mention to Panos Fun Park), supermarkets easy to reach, wonderful beaches Porto Katsiki, Egremni, waterfalls in the middle of the island... The house is so beautiful that you just don't want to leave. It is comfortable, clean, spacious. Perfect, really. We will go back for sure. 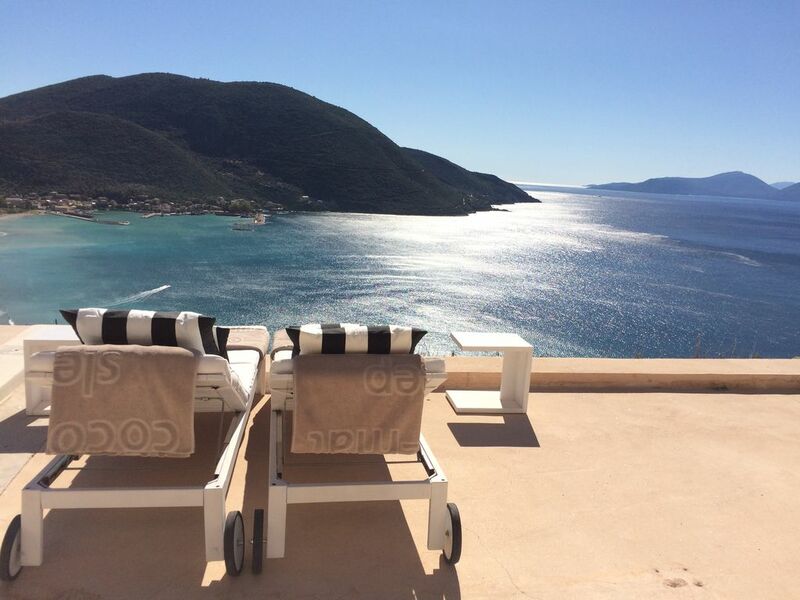 The villa is stunning , the view is amazing of vassiliki bay. You do need a car though as it is high up.it is peaceful and relaxing to sit in the infinity pool or jacuzzi and just watch the boats below. George looked after us really well and he and the cleaning lady were unobtrusive . The villa was equipped beautifully ..everything you could need was there. Would definitely recommend this ...and it is one of the few places we would go back to. This is a very beautifull, spacious and extremely clean villa. We stayed there for 14 nights and we were all impressed by the simplicity of the style, and the amazing view. We are so grateful to them for making our stay extra special. The suite itself is beautiful, very clean and comfortable. The view is incredible! We spent a lot of time lounging on our terrace enjoying the pool and our BBQ. I would recommend this accommodation to others as I believe its laid back luxurious atmosphere is one many would appreciate. The George were very nice and friendly which made it all the more enjoyable. Many thanks for everything with the promise that we' ll come back SOON! Για να κάνουν τη διαμονή σας πιο άνετη είμαστε σε θέση να προσφέρουμε ενοικιάσεις αυτοκινήτων και σκαφών βοήθεια, ημερήσιες κρουαζιέρες στα κοντινά νησιά, θαλάσσιο σκι, καταμαράν και μαθήματα ιστιοσανίδας. Rate is for 4 persons including maid service, electricity, water and taxes. We provide all linen except towels for the beach and we change it every three days. Babies 0-3 free of charge. Extra persons will be charged 15-30 euros ( depending from the season )...The customers have 2 days time to deposit 30% in our bank account.If not we have the right to give the villa to another costumer. __________________________________________________________________________________________________ Booking Acceptance: Please be informed that we are not accepting bookings within Mondays to Fridays. We are accepting bookings either Saturdays to Saturdays or Sundays to Sundays.